As someone who loves photography, historic structures and bridges, railroad stuff, scenery, engineering feats, and scenic places, Starrucca Viaduct has long been a place that I have wanted to check out. The opportunity arose to finally go check out this spectacular bridge, and I could not pass it up. Starrucca Viaduct was one of the most ambitious engineering triumphs of its time, and set the tone for the ambitious growth of the railroad industry. Dating all the way back to 1848, it remains as one of the tallest stone-arch masonry bridges in the world, more than 160 years after it was built. It even predates the standardization of railroad gauges, for it was initially built with 6 foot wide track, largely to maintain monopoly status. Later on, there would be a contentious battle to standardize rail gauges at 4 feet and 8.5 inches and the Erie Railroad would eventually comply. This left a significant amount of extra room on the railroad right-of-way. This bridge and rail line was fundamental in helping grow New York City, with it carrying fresh foods from the midwest, in addition to industrial goods, and coal for heating. Starrucca Viaduct is in the Endless Mountains region of Pennsylvania, in Susquehanna County, not far from the PA/NY border. This stunning bridge dates back to 1848 and remains one of the world's tallest railroad stone arch bridges, with piers ranging from 90-100 feet. 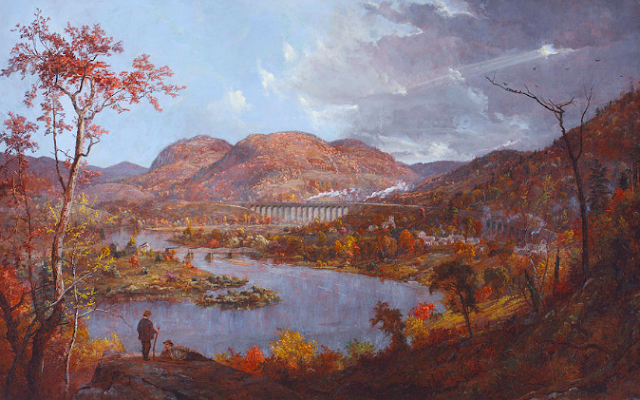 It carries the New York, Susquehanna, and Western Railroad, and was originally built by the Erie Railroad in the midst of its push to make the first railroad connection between New York and Lake Erie, which would eventually connect between New York and Chicago. The bridge was an incredibly ambitious project especially considering that this is purely stone masonry, with no steel reinforcement. The bases are concrete, which may have been the first use of structural concrete in an American bridge. That stone is not a facade, but masterfully crafted stone work that is in pristine shape and still receives regular freight train traffic. Many bridges that are not even a fraction of the age of this span have not stood the test of time that this giant has. The stone, ashlar bluestone, was sourced from local quarries within the immediate area of the bridge. Old telegraph poles are still extant adjacent to the bridge, and on the perpendicular right-of-way that was once used by the D&H (Delaware and Hudson). That rail line was abandoned decades ago. On private property, just down the road, you can see a neat metal-lattice bridge on the old line. It is clearly visible, but not open to be explored. I can only imagine how incredible it was to see this construction, especially with none of the equipment and safety equipment that we see today. I do not envy the risks that these workers had to take in order to put food on their table for their families. My immigrant ancestors came here around the time that Hosea gave this account, going down into the coal mines and dying young from diseases that would have been preventable with minimal safety equipment. Knowing that the laborers on this bridge did not have basic safety equipment, such as helmets, respirators, and harnesses, these guys put their lives on the line to support their families. This bridge is a testament to those efforts, still functioning in pristine shape, more than 160 years after it was constructed. The arches are truly a sight to behold. Some of these rocks demonstrate Hosea Benson's account of the construction, showing the chiseled holes that were used to lift stones into place. This is one seriously stunning structure. The surroundings of the bridge are so idyllic that it has even shown up within a landscape painting by Jasper Francis Crospey from 1865. Luciana Park offers cool views of the bridge, and these neat informational panels. The bridge crossing Starrucca Creek. It meets with the Susquehanna River in just a few hundred feet. This concrete arch bridge is just down the road from Starucca and is impressive on its own. Though, within a half hour drive of this spot, you can see the incredible Martin's Creek and Tunkhannock Viaducts. The Susquehanna, PA, Erie Railroad train station is located just down the street. It is in the midst of being revamped. It has sat vacant for a long time, after serving as an eatery. It was built in 1863, and passenger service ceased in 1970. The station is in the midst of being redone, which is no small feat. For updates on this project, check out the Reviving the Starrucca House Page. Overall, the Starrucca Viaduct is well worth going out of your way to see. The countryside surrounding it is very nice, and the bridge is just incredible. Northwestern Bedford County is home to a series of awesome covered bridges. Five of the county's 14 covered bridges are within a 15 minute drive of each other, with four of those crossing Dunning's Creek, with all of them being absolutely gorgeous. Our first stop is at Cuppett's Covered Bridge in New Paris. This covered bridge is just a short drive from Gravity Hill and the Allegheny Front Hawk Watch, making it a wonderful place to check out. Through the years as wood has been replaced, they have opted to go with a rustic wood look instead of repainting it the traditional white and red of Bedford County. It is a pedestrian bridge now, located just to the side of the road that bypassed it, Route 96. This bridge is in pristine shape and open to vehicular traffic, but this is thanks to a community effort to rebuild the bridge in 2002 after some knuckleheads tried to get their jollies through arson. Renovation just a few years prior to reinforce the bridge had remained intact, so they were able to easily repair the bridge. It is a shame that efforts like this have to be undertaken though. The bridge is surrounded by farmland, forest, and a mountain, on top of its creek setting. It is an absolute beauty. While this bridge is privately owned, it is impeccably maintained. My first reaction after seeing this was that I am glad that this bridge has retained its original Burr Truss construction style. Even if this means that the bridge cannot handle normal daily traffic, the bridge retains its original integrity. Many bridges are often reinforced, which is a nice thing in keeping the bridges in the community and an eye upon the heritage of the bridges, but it is nice to see bridges that retain their original integrity. The downside to this is that the bridges require more maintenance to preserve them without steel reinforcements, and this is especially difficult if the bridge is privately owned and funding is limited for preservation. A fine case in contrast with this beautiful covered bridge is the Felton Covered Bridge on the other side of the county, which has received zero maintenance and appears to be on the verge of collapse. I am happy to report that the Dr. Knisley Bridge is in excellent shape with authentic structural integrity. The property that the bridge sits on seems to be the pride and joy of the owner. The area immediately surrounding the bridge is a beautiful grove of trees. There are quaint farm fields just beyond the treeline. Snooks has a very similar appearance to the nearby Ryot Covered Bridge. It is a beautiful span that is maintained by Bedford County. We finish at Bowser Covered Bridge. This has always been one of my favorite covered bridges in the state. This is a great place to launch off to Blue Knob State Park, home to the second tallest mountain in Pennsylvania, with tremendous views, hikes, and the ski area with the second highest elevation change in the state. For more information, check out this article from a prior visit. Overall, Bedford County is a wonderful place to check out covered bridges. Northwestern Bedford County is home to a series of great spans that are located very close to each other. We highly recommend checking them out.